2 Grades: Stronger player takes white in a two game match. 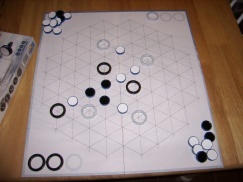 In the first game White removes the left lance only; in the second game, white removes the Bishop only. 6 Grades: Stronger player takes white in a two game match and removes the Rook and Lance in the first game; in the secong game White removes the Rook and Bishop. http://www.gipf.com is the website for the Gipf project. Also, I was going to try to put together an enhanced podcast, but it doesn’t look like there are good tools for Windows. I found an article on using scripts to simulate the Mac format. Does anyone have any experience putting these together, preferably using free tools. I’ve put together a quick promo for the show. Anyone who wants to play this in their podcast may do so. If you do, I’d love to know about it, so drop me an e-mail. If you’re interested in my podcast, it’s likely I’m interested in yours. Well, here is episode 2. It sounds like there is still a buzz in the beginning, but it goes away pretty quick. I’ll try to root cause the problem if it comes back. http://www.shogi.net/rjhare gives a good explanation of Shogi. http://www.shogivariants.com is a wiki for all forms of Shogi. It’s still being formed. It looks like the section on the Chu Shogi pieces didn’t get added to the end. All that information can be found in the Chu Shogi section of the Shogivariants site. I can’t believe I said it, but when I said that you couldn’t drop a piece to cause checkmate, I was specifically thinking about a Pawn. You can drop to cause checkmate, with any piece other than a pawn. Also, to clarify, the lion can step back into it’s starting square. This allows for a passing move to be possible with a lion. You can also capture a piece and step back. This is called capturing by igui. Welcome to the Abstract Gamer podcast and blog. In this forum I am going to try to give coverage to the wonderful world of Abstract Games. 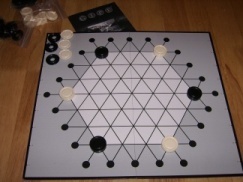 I’ll focus on Abstract Strategy Games primarily, but will cover any themeless game that I feel like talking about. It’s also possible that I’ll talk about Designer Games, Party Games, Card Games, and who knows, perhaps even the occasional RPG or computer game. Ive recorded a first episode for the podcast, but Im not happy with the quality, so I am going to re-record. Here is the first episode, but I will not be putting this into the feed. The new recording will cover the same information, but in a more satisfying way.